In November of 1864 — by which time just over 20 burials had taken place in the newly-opened General Cemetery in Stanton Road — the Sheffield and Rotherham Independent described its appearance …. “passing through the gate, near what appears to be a lodge, the visitor is surprised to behold all the graves entirely level with the rest of the ground. No hillock of mortality indicates the solemn retreat of the dead. No mounds arrest attention, no stone enumerates the former merits of the dead. In nearly every country, some hillock, mound, or memorial indicates a grave, but at Ilkeston cemetery at present no such custom prevails, no pious decorations are visible, no funeral emblems suggest hope or show respect for the departed, and even flowers, the offerings of friends to assuage grief or convey a lesson, bloom not over any coffined remains in Ilkeston cemetery”. It was truly a ‘cemetery without memorials‘. We fast-forward just over 150 years and now this couple of acres is no longer ‘without memorials’… though the majority are now distinctly showing their age. Let’s take a stroll among them and spend a pleasant afternoon examining them more closely !! 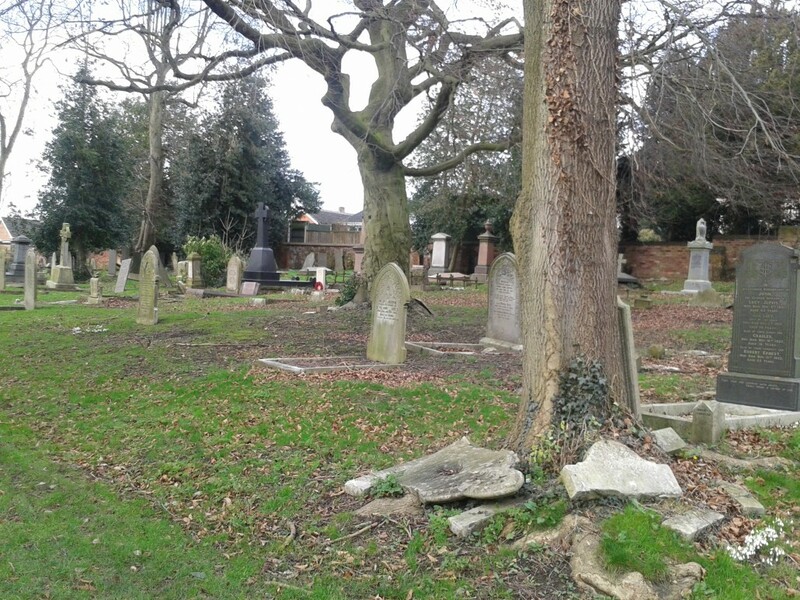 As we walk along the central path of the cemetery, we shall start by looking at the graves in the plot on our right. One of the first ones we come to is that of Clara Rollinson. Her baptism record of the Slade Primitive Methodist Chapel records her as Clara Wood, born in April 1827 to shoemaker Thomas and Charlotte Wood. Thus on the 1841 census she was aged 14. However, by the 1851 census, she had ‘lost’ several years and was then aged 19; in 1861 her age was recorded as 28. In this year she married William Rollinson and by 1871 she was 38, while in 1881 her age was 47. By 1891 she was listed as aged 57 and in 1901 was aged 68. On February 24th 1902 she died, when her age is registered as 70. Her gravestone however records that she was 72. A short distance away is the grave of Samuel Carrier who died at Nottingham on January 20th 1865 . His body was returned to Ilkeston to be buried in the General Cemetery and his stone declares that he was aged 47. If his birth details at the Wesleyan Methodist Chapel are accurate then he was two days short of his 47th birthday when he died !! 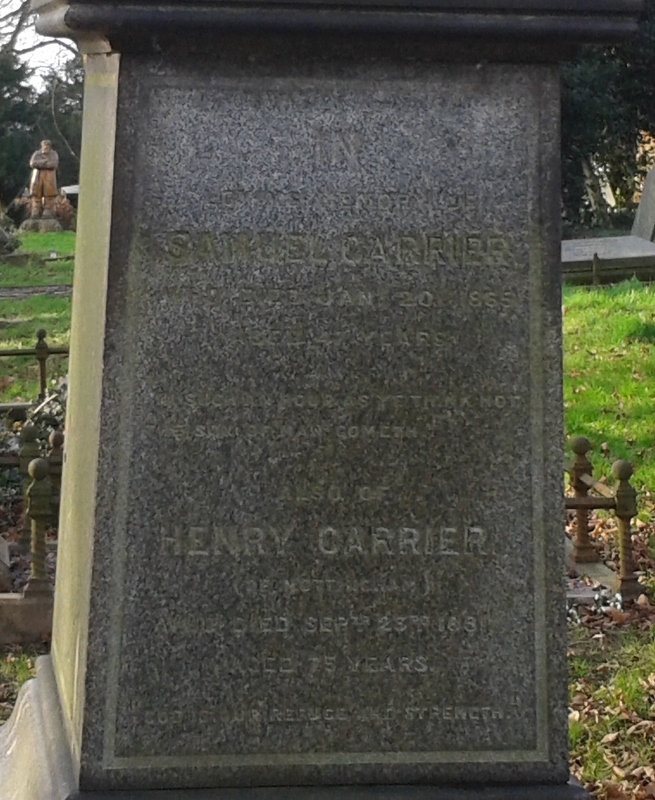 Samuel lies with his older brother Henry Carrier who also died in Nottingham, September 3rd 1881. Baptised on November 12th 1806 and with a registered age at death of 74, his stone shows an age of 75. A little deeper into this section is the grave of Elizabeth Lee, wife of William, who died ‘in her 76th year’. She was baptised at Cossall Parish Church on May 17th 1818, as Elizabeth Fritchley, daughter of Richard and Jenny (nee Attenborough), married William Lee on January 9th 1842 at St. Mary’s Church, Nottingham, and died on April 20th 1895, her death registration showing an age of 76. 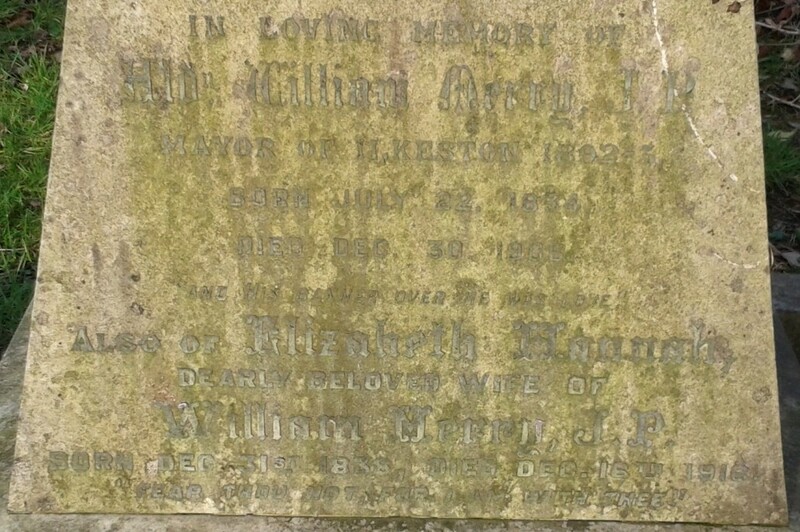 A short distance away lies Elizabeth Hannah Merry, the wife of Alderman William Merry, who, according to her stone, was ‘born on Dec 31st 1838’. She was the daughter of Francis and Ann Sudbury, born on December 31st 1837, and registered as ‘Elizabeth Ann Sudbury’. 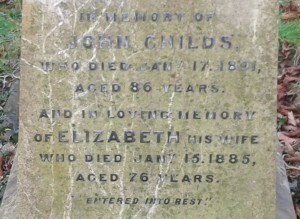 And then the grave of John Childs who died on January 17th 1891, and where his registered age of 85 conflicts with that of 86 shown on his memorial. 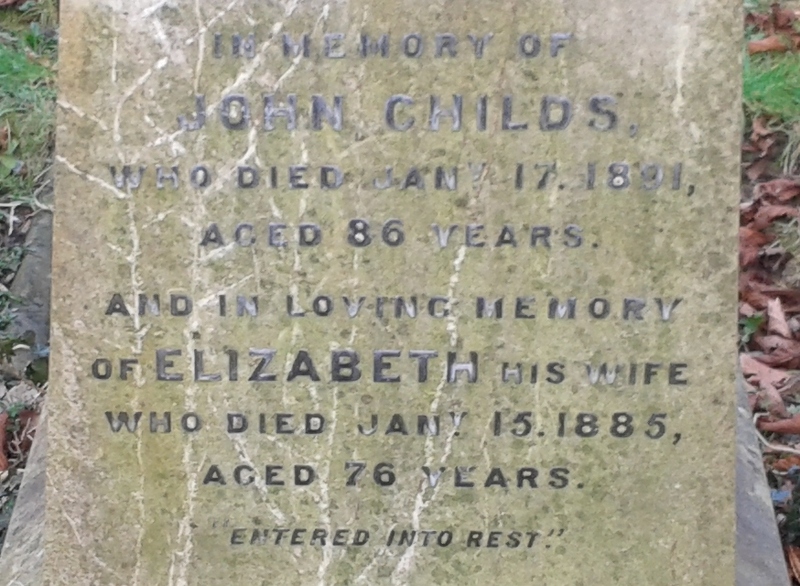 And backing on to the grave of John Childs is that of Joseph Siddons, baptised on September 12th 1811 at Barwell, Leicestershire and who died in Belper Street, Ilkeston, on March 3oth 1876. His slate memorial calculates his age to be 63 … do you agree? 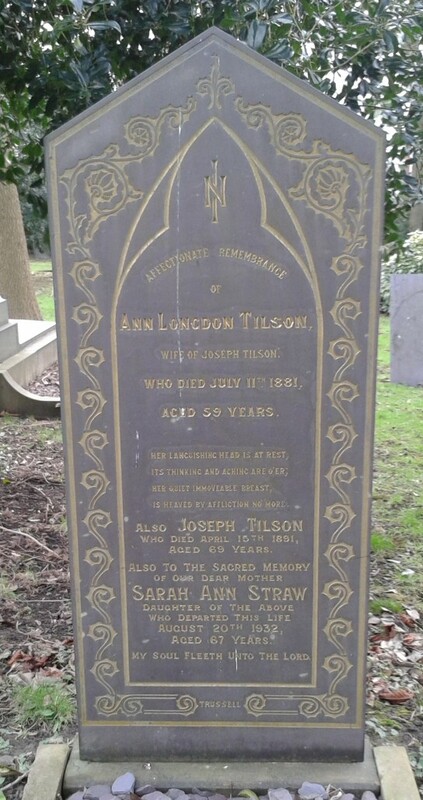 Ann Longdon married Joseph Tilson on April 11th 1842 when she gave her age as 22. On the 1881 census for Ilkeston, Joseph is lodging in East Street and is described as a widower — that is because his wife Ann died on July 11th 1878, aged 59, and was buried three days later. However her gravestone states that she died on July 11th 1881. Husband Joseph Tilson was born on September 17th 1822 and baptised three weeks later at the Wesleyan Chapel. He died on April 15th 1891, when the same gravestone describes him as aged 69. But was he ?! In an adjacent grave we find Harriet Howard, the wife of Benjamin, who was baptised Harriet Allen in November 1808 and died on April 8th 1876. Her registered age at death was 68, one more than that shown on her gravestone. Conversely Market Place draper William Smith died on February 23rd 1888 with a registered age of 60, one less than the age shown on the nearby gravestone. George Hallam was baptised at the Wesleyan Chapel in Ilkeston on December 23rd 1832 when his birthday was ‘remembered’ as November 16th 1820. He died on October 2nd 1897, ‘in his 80th year‘. ?? All the sources I have looked at — including his gravestone — indicate that Matthew Hobson, who died on August 12th 1884, was aged 74 at that time. He was baptised at Ilkeston Independent Chapel on April 20th 1811 when his birthday was recorded as October 24th 1810. Doesn’t that make him 73 when he died? 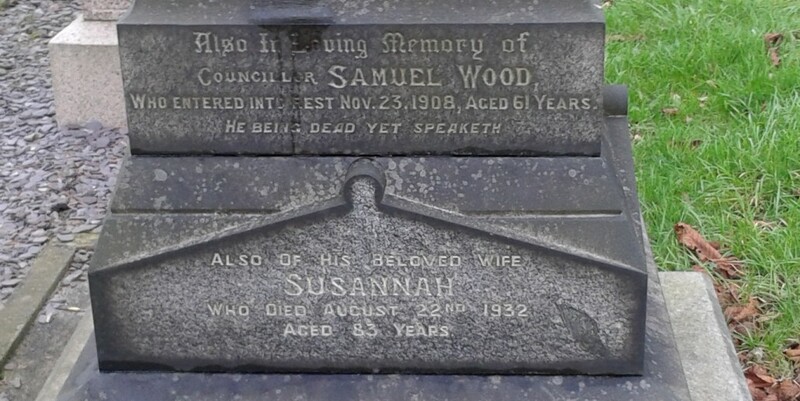 Councillor Samuel Wood died at his family residence of Edmont House in Burns Street on November 23rd 1908, aged 61 … or so it says on his splendid memorial. The same memorial states that his wife Susannah (nee Straw) was aged 83 when she died on August 22nd 1932. Now, Samuel was born and baptised in 1848, meaning he was no more than 60 when he died. And Susannah was born on September 3rd 1850, making her 81 at her death? John Taylor, gentleman farmer of the Manor House, was baptised at the Unitarian Chapel of Ilkeston on December 1st 1811, having been born a few weeks earlier, on November 6th, at Little Hallam. He died at Spondon on October 19th 1892 and his large marble stone declares that he was aged 81. On to Part 2 ? Or shall we now walk on to the bottom of Stanton Road and meet the Wilkinson family.